My previous post was all about the delicious inspiration served up over at Frugal Feeding, (noodle broth + spring rolls) and while he offers his own recipe for spring rolls, I chose to simply use what I had on hand. 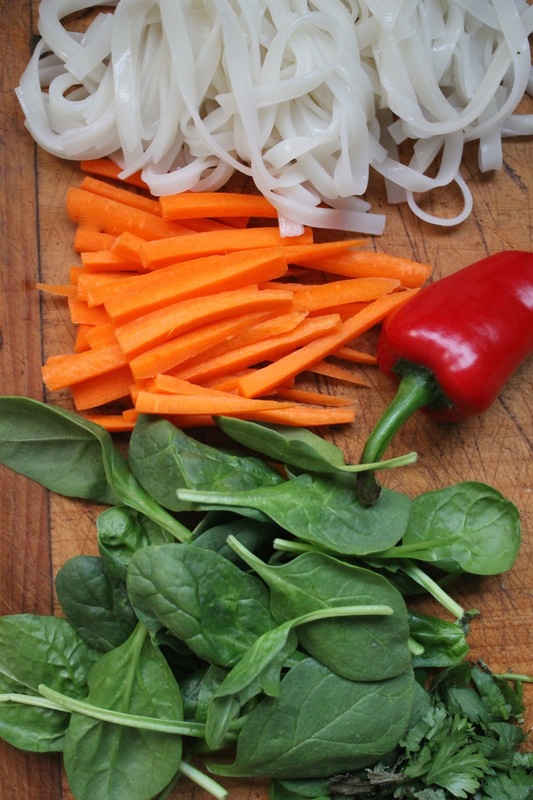 You’ll need one packet of Spring Roll Wrappers and rice noodles, plus whatever filling you’d like to add – see my list below for ideas. 1. Fill a shallow tray/dish with hot water and place a spring roll wrapper into the water until it is soft and pliable (about 15-20 seconds). 2. Remove the wrapper and gently lay onto a damp tea towel and blot until until it is slightly sticky/dry. 3. Place the filling of your choice in the middle of the wrapper and then fold in two opposing sides, not fully covering the filling, then roll the third side over and upwards to form a neat roll shape. 1. Mix all ingredients in bowl. Use one (more/less) heaping spoon full of mixture per wrapper (or whatever portion you find suitable for the wrappers you are using). 2. Place mixture in center of wrapper, add a dash of tamari or soy sauce and roll as instructed above. 3. Serve immediately. Or deep fry for about 2 minutes and serve with dipping sauce. We used tamari, though a sweet and sour chili sauce would be lovely too! We enjoyed them both fresh and fried. See for yourself. 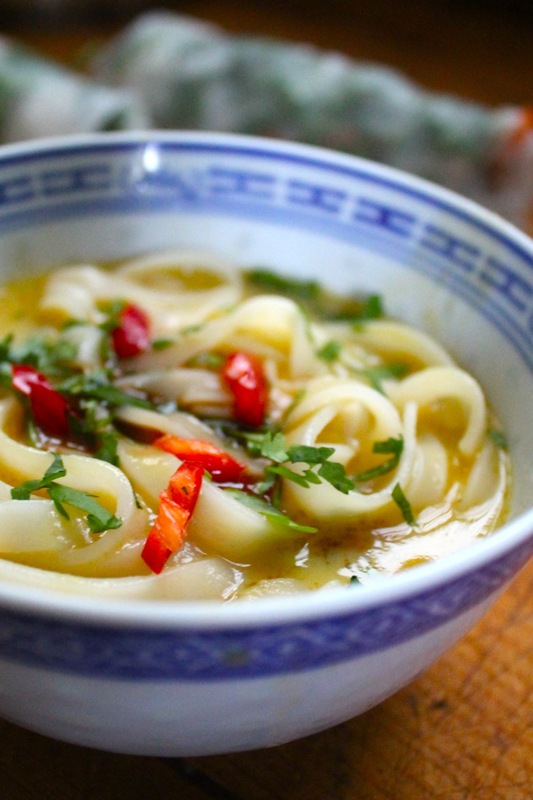 This is a refreshingly light, yet extremely satisfying meal…especially when served with noodle broth. How do you like your spring rolls? This entry was posted in cooking recipes, eating, everyday life and tagged cooking, food, healthy recipes, photography, spring rolls by ripe red berries. Bookmark the permalink. Yum! 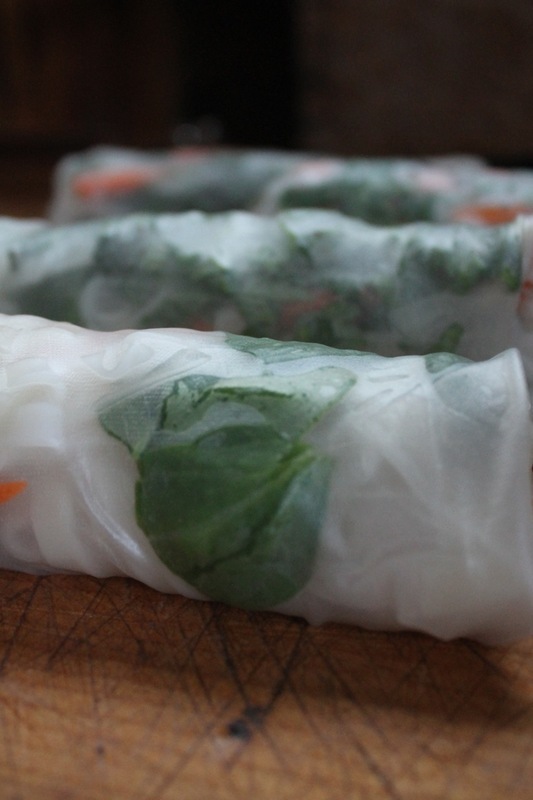 I love spring rolls but for some reason I’ve never thought to make them myself. Thanks for the great idea! Your welcome! I hope you try them – they are worth the effort. It’s like a lot of things – do it once or twice and it just keeps getting easier; it’s similar to rolling a burrito, but a bit more ‘delicate’…enjoy! I’m definitly going to try this. Other than the noodles, do you cook any of the other ingredients? Love the “print this recipe” you’ve come up with. Very professional. So glad to hear your going to try these! Let me know how they come out…I didn’t cook any of the ingredients other than the noodles, though, Frugal Feeding did saute all the ingredients…so I think it’s a personal choice in the end. I prefer the crunch of the raw, though cooked would be just as tasty. I did try one roll with warm noodles and the rice wrapper did not hold up to the heat – it ripped rather quickly…so I’d suggest allowing the ingredients (filling) to cool prior to using (if cooking veggies). I hope you enjoy them!